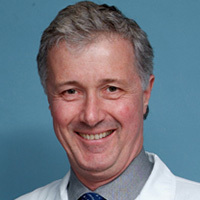 Dr. Alexander Patterson is a professor of surgery and director of the Lung Center at the Washington University School of Medicine in St. Louis. Patterson, a cardiothoracic surgeon at the affiliated Alvin J. Siteman Cancer Center, has clinical expertise in lung transplantation, lung volume reduction, esophageal cancer and other malignancies of the chest, including malignant pleural mesothelioma. He is known internationally as part of the surgical team in Toronto that performed the world’s first successful adult lung transplant in 1983, laying the groundwork to build a highly regarded program at Barnes-Jewish Hospital in St. Louis. For decades, Patterson has been heralded for his leadership ability, mentoring younger physicians, residents, and fellows, along with teaching advanced surgical techniques. He was one of the first surgeons in the country — decades ago — to emphasize the need for a multidisciplinary approach to treatment and to building a comprehensive program. To recognize his longtime contributions, Washington University in 2018 created an endowed distinguished chair in his name, one of the highest honors bestowed upon a clinical scientist. For his work, he has been heralded as a surgical trailblazer in the field of transplantation, but also for his research and scientific advances. Dr. Benjamin Kozower, who also handles cases of mesothelioma at Siteman, credits Patterson as the biggest influence on his surgical career. He calls him his hero. Dr. Daniel Kreisel, who has worked alongside Patterson for more than a decade in St. Louis, takes a similar tone. Patterson earned his medical degree from Queens University in Kingston, Canada. He did a residency at the University of Toronto and a fellowship at Johns Hopkins University in Baltimore. He handles heart-lung transplants, myasthenia gravis, disease of the airway and tracheal tumors. He’s still charting a course for others to build upon. Patterson is proponent of early lung cancer screening and the benefits it produces. But he also has been speaking for years on more obvious ways to reduce the number of lung cancer cases he sees. Disclaimer: Dr. Alexander Patterson has no professional affiliation with Asbestos.com. The Foundation for Barnes-Jewish Hospital. (2018, August 27). Mid-America Transplant Creates First-Ever Endowed Distinguished Chair. Washington University Physicians. (n.d.). G. Alexander Patterson, MD. Abranas, C. (2011, October 26). Chest X-rays don’t reduce lung cancer deaths.